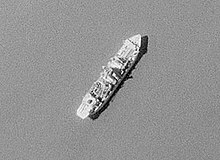 This article is about the CIA ship used to recover a sunken Soviet submarine as part of Project Azorian. For the deep-sea oceanographic research and scientific drilling vessel, see Glomar Challenger. Builder: Sun Shipbuilding and Drydock Co.
GSF Explorer, formerly USNS Hughes Glomar Explorer (T-AG-193), was a deep-sea drillship platform initially built for the United States Central Intelligence Agency Special Activities Division secret operation Project Azorian to recover the sunken Soviet submarine K-129, lost in March 1968. Hughes Glomar Explorer, as the ship was named at the time, was built between 1971 and 1972, by Sun Shipbuilding and Drydock Co. for more than US$350 million (approximately $1.4 billion in 2018) at the direction of Howard Hughes for use by his company, Global Marine Development Inc. It first began operation on 20 June 1974. Hughes told the media that the ship's purpose was to extract manganese nodules from the ocean floor. This marine geology cover story became surprisingly influential, causing many others to examine the idea. But in sworn testimony in United States district court proceedings and in appearances before government agencies, Global Marine executives and others associated with Hughes Glomar Explorer project maintained unanimously that the ship could not be used for any economically viable ocean mineral operation. As K-129 had sunk in very deep water, at a depth of 16,500 feet (3.125 miles or 5.029 kilometres), located 1,560 miles (2,510 km) NW of Hawaii, a large ship was required for the recovery operation. Such a vessel would be detected easily by Soviet vessels, which might then interfere with the operation, so an elaborate cover story was developed. The CIA contacted Hughes, who agreed to assist. While the ship did recover a portion of K-129 in 1974, a mechanical failure in the grapple caused two-thirds of the recovered section to break off during recovery. This lost section is said to have held many of the most sought items, including the code book and nuclear missiles. It was subsequently reported two nuclear-tipped torpedoes and some cryptographic machines were recovered, along with the bodies of six Soviet submariners, who were given a formal, filmed burial at sea. The operation became public during February 1975 when the Los Angeles Times published a story about "Project Jennifer", followed by news stories with additional details in other publications, including The New York Times. The CIA, wanting neither to confirm nor deny the story, issued the Glomar response, which set the precedent for subsequent responses to Freedom of Information Act requests. The true name of the project was not known publicly to be Project Azorian until 2010. 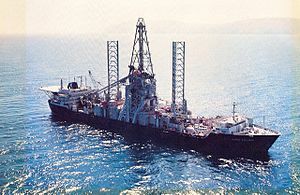 The publication Red Star Rogue (2005) by Kenneth Sewell makes the claim "Project Jennifer" recovered virtually all of K-129 from the ocean floor. Sewell states, "[D]espite an elaborate cover-up and the eventual claim that Project Jennifer had been a failure, most of K-129 and the remains of the crew were, in fact, raised from the bottom of the Pacific and brought into the Glomar Explorer". [N 1] A subsequent movie and book by Michael White and Norman Polmar revealed testimony from on-site crewmen as well as B&W video of the actual recovery operation. These sources indicate that only the forward 38 ft (12 m) of the submarine were recovered. While the ship had an enormous lifting capacity, there was little interest in operating the vessel because of her great cost. From March to June 1976, the General Services Administration (GSA) published advertisements inviting businesses to submit proposals for leasing the ship. By the end of four months, GSA had received a total of seven bids, including a US$2 million offer (equivalent to $7.01 million in 2018) submitted by a Lincoln, Nebraska college student, and a US$1.98 million offer ($6.94 million in 2018) from a man who said he planned to seek a government contract to salvage the nuclear reactors of two United States submarines. The Lockheed Missile and Space Company submitted a US$3 million ($10.52 million in 2018), two-year lease proposal contingent upon the company's ability to secure financing. GSA had already extended the bid deadline twice to allow Lockheed to find financial backers for its project without success and the agency concluded there was no reason to believe this would change during the near future. Although the scientific community rallied to the defense of Hughes Glomar Explorer, urging the president to maintain the ship as a national asset, no agency or department of the government wanted to assume the maintenance and operating cost. Subsequently, during September 1976, the GSA transferred Hughes Glomar Explorer to the Navy for storage, and during January 1977, after it was prepared for dry docking at a cost of more than two million dollars, the ship became part of the Navy's Suisun Bay Reserve Fleet. During September 1978, Ocean Minerals Company consortium of Mountain View, California announced it had leased Hughes Glomar Explorer and that during November would begin testing a prototype deepsea mining system in the Pacific Ocean. The consortium included subsidiaries of the Standard Oil Company of Indiana, Royal Dutch Shell, and Boskalis Westminster Group NV of the Netherlands. Another partner, and the prime contractor, was the Lockheed Missiles and Space Company. During 1997, the ship was moved to Atlantic Marine's Mobile, Alabama shipyard for modifications that converted it to a dynamically-positioned deep sea drilling ship, capable of drilling in waters of 7,500 feet (2,300 m) and, with some modification, up to 11,500 feet (3,500 m), which is 2,000 feet (610 m) deeper than any other existing rig. The conversion cost more than $180 million ($264 million in 2018) and was completed during the first quarter of 1998. The conversion of the vessel from 1996-1998 was the start of a 30-year lease from the U.S. Navy to Global Marine Drilling at a cost of US$1 million per year ($1.5 million per year in 2018). Global Marine merged with Santa Fe International Corporation during 2001 to become GlobalSantaFe Corporation, which merged with Transocean Inc. during November 2007 and operated the vessel as GSF Explorer. During 2010, Transocean acquired the vessel in return for a US$15 million ($17 million in 2018) cash payment. The vessel was reflagged from Houston, US to Port Vila, Vanuatu during the third quarter of 2013. Transocean announced during April 2015 that the ship would be scrapped. The World Ship Society's November 2015 magazine stated that the ship arrived at the Chinese ship breakers at Zhoushan on 5 June 2015. Not to be confused with Glomar Challenger, "the first research vessel specifically designed in the late 1960s for the purpose of drilling into and taking core samples from the deep ocean floor." ^ Minutes of the Sixth Plenary Session, USRJC, Moscow, 31 August 1993. ^ a b c "ABS Record: GSF Explorer." American Bureau of Shipping, 2010. Retrieved: 25 December 2010. ^ Burleson 1997, p. 52. ^ "Mysteries of the Deep: Raising Sunken Ships: The Glomar Explorer." Scientific American Frontiers (PBS), p. 2. Retrieved: 25 December 2010. ^ Snieckus, Darius. "...and another thing... An offshore Hughes who... " OilOnline, 1 November 2001. Retrieved: 25 December 2010. ^ Phelan, James. "An Easy Burglary Led to the Disclosure of Hughes-C.I.A. Plan to Salvage Soviet Sub". The New York Times, 27 March 1975, p. 18. ^ Sontag et al. 1998, p. 196. ^ Sontag et al. 1998, p. 277. ^ "Neither Confirm Nor Deny". Radiolab. Radiolab, WNYC. 12 February 2014. Retrieved 18 February 2014. ^ Sewell 2005, pp. 128, 148. ^ Podvig 2001, p. 243. ^ Sewell 2005, pp. 131, 261. ^ "Notice of Availability for Donation of the Test Craft Ex-Sea Shadow (IX-529) and Hughes Mining Barge (HMB-1)." Federal Register, Volume 71, Number 178, 14 September 2006, p. 54276. ^ Toppan, Andrew. "The Hughes Glomar Explorer's Mission." the-kgb.com. Retrieved: 25 December 2010. ^ Pike, John. "Project Jennifer: Hughes Glomar Explorer." Intelligence Resource Program via fas.org, 16 February 2010. Retrieved: 25 December 2010. ^ "Transocean 10Q SEC Filing on 4 August 2010."brand.edgar-online.com. Retrieved: 25 December 2010. ^ rigzone.com Retrieved: 17 December 2013. ^ "Transocean’s new fleet status, scraps GSF Explorer" Offshore Engineer Retrieved: 17 April 2015. ^ Journal of the World Ship Society Volume 69, No 11, November 2015 Retrieved 17 December 2015. ^ Watson, Jim. "USGS." usgs.gov, 5 May 1999. Retrieved: 25 December 2010. Burleson, Clyde W. The Jennifer Project. College Station, Texas: Texas A&M University Press, 1997. ISBN 978-0-89096-764-5. DeLuca, Marshall and William Furlow, eds. "Steeped in history, Glomar Explorer finally returns to industry, Converted vessel set to drill in record water depth." Offshore magazine, Volume 58, Issue 3, March 1998. Dunham, Roger C. Spy Sub: Top Secret Mission To The Bottom Of The Pacific. New York: Penguin Books, 1996. ISBN 0-451-40797-0. Polmar, Norman & Michael White. PROJECT AZORIAN-The CIA and the Raising of the K-129. Naval Institute Press. 2010. ISBN 978-1-59114-690-2. Sewell, Kenneth. Red Star Rogue: The Untold Story of a Soviet Submarine's Nuclear Strike Attempt on the U.S. New York: Simon & Schuster, 2005. ISBN 0-7432-6112-7. Sharp, David (2012). The CIA’s Greatest Covert Operation: Inside the Daring Mission to Recover a Nuclear-Armed Soviet Sub. Lawrence, KS: University Press of Kansas. p. 344. ISBN 978-0-7006-1834-7. Sontag, Sherry, Christopher Drew with Annette Lawrence Drew. Blind Man's Bluff: The Untold Story of American Submarine Espionage. New York: Harper, 1998. ISBN 0-06-103004-X. Varner, Roy and Wayne Collier. A Matter of Risk: The Incredible Inside Story of the CIA's Hughes Glomar Explorer Mission to Raise a Russian Submarine. New York: Random House, 1978. ISBN 0-394-42432-8. Wikimedia Commons has media related to USNS Glomar Explorer (T-AG-193). Virtual tour inside HMB-1 and Sea Shadow, 2011, includes HMB-1 operating manual. The secret on the ocean floor, BBC (2018). This page was last edited on 24 March 2019, at 22:56 (UTC).